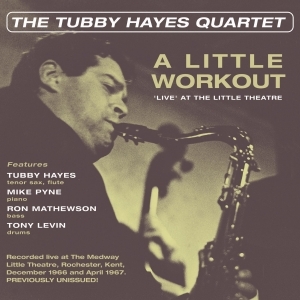 When the Tubby Hayes and his new quartet alighted on the Little Theatre in Rochester, Kent for two evenings' worth of performances during the winter/spring of 1966/67 both the leader and the band’s music were in a period of transition. Drawing equal inspiration from both the recent innovations of Miles Davis and John Coltrane and the energy of his new, young and adventurous sidemen, Hayes was to turn these to-all-intents-and-purposes typical provincial club nights into definitive manifesto statements of his contemporary musical ambitions. Luckily, excerpts from both these performances were captured on tape. Occasionally bootlegged, the recordings made on these two gigs half a century ago illustrate everything the saxophonist had learned, experienced and pioneered up to that moment; from the blistering paint-off-the-walls bebop of “Walkin’”, a solo to rank alongside any of John Coltrane or Sonny Rollins’ extended forays from the Sixties, through to the astonishing emotional denouement of a seventeen-minute deconstruction of “Dear Johnny B.” - this isn't Hayes merely on form; this is him on fire! This new Acrobat CD is the first ever release of these recordings and comes packaged with rare, hitherto unpublished photographs and a fascinating booklet note by award-winning saxophonist Simon Spillett – author of The Long Shadow of The Little Giant: The Life, Work and Legacy of Tubby Hayes.